The purpose of this research was to learn about community-based child protection processes and mechanisms in two mostly rural areas of Kilifi, Kenya. The research is intended to complement and extend the learning that came from previous research by the Inter-Agency Learning Initiative in two urban slums of Mombasa, Kenya. By using a mixture of urban and rural sites, the Inter-Agency Learning Initiative, which guides this research, aimed to provide a glimpse of the diversity that exists within Kenya. 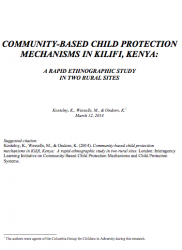 The ethnographic approach used in this phase of research aimed to learn about existing community-based child protection processes and mechanisms and how they are actually used and relate to aspects of the more formal child protection system in Kenya. In particular, the research sought to identify how local people understand children and childhood, what they saw as the main harms or risks to children, what community-based child protection mechanisms (CBCPMs) existed and how they were used, what protective factors enabled children’s positive coping and resilience, and whether and how the CBCPMs linked with elements of the formal, government led aspects of the national child protection system.